6 years of highly visible Dodd-Frank legislation and thousands of lines of regulation, with no public debate, was just quietly removed and "neutered" by the stealth of an "Ear-Mark". To maintain government financing the banks have held Washington hostage. Maintain our profit margins and have the public accept the risk of $3003 TRILLION or..... else! Citigroup Written Legislation Moves Through the House of Representatives. The Bill (yet another 'Ear-Mark') allows financial institutions to trade certain financial derivatives from subsidiaries that are insured by the Federal Deposit Insurance Corp. — potentially putting taxpayers on the hook for losses caused by the risky contracts. Big Wall Street banks had typically traded derivatives from these FDIC-backed units, but the 2010 Dodd-Frank financial reform law required them to move many of the transactions to other subsidiaries that are not insured by taxpayers. Decency, security, and liberty alike demand that government officials shall be subjected to the same rules of conduct that are commands to the citizen. In a government of laws, existence of the government will be imperiled if it fails to observe the law scrupulously. Our government is the potent, the omnipresent teacher. For good or for ill, it teaches the whole people by its example. Crime is contagious. If the government becomes a lawbreaker, it breeds contempt for law; it invites every man to become a law unto himself; it invites anarchy. To declare that in the administration of the criminal law the end justifies the means — to declare that the government may commit crimes in order to secure the conviction of a private criminal — would bring terrible retribution. Against that pernicious doctrine this court should resolutely set its face. While most Americans are busy Christmas shopping and making preparations for trips to see family, Congress remains hard at work doing what it does best. Giving gifts to Wall Street and trampling on citizens’ civil liberties. The acrimony that erupted Thursday between President Obama and members of his own party largely pivoted on a single item in a 1,600-page piece of legislation to keep the government funded: Should banks be allowed to make risky investments using taxpayer-backed money? The very idea was abhorrent to many Democrats on Capitol Hill. And some were stunned that the White House would support the bill with that provision intact, given that it would erase a key provision of the 2010 Dodd-Frank financial reform legislation, one of Obama’s signature achievements. But perhaps even more outrageous to Democrats was that the language in the bill appeared to come directly from the pens of lobbyists at the nation’s biggest banks, aides said. The provision was so important to the profits at those companies that J.P.Morgan’s chief executive Jamie Dimon himself telephoned individual lawmakers to urge them to vote for it, according to a person familiar with the effort. The nation’s biggest banks — led by Citigroup, J.P. Morgan and Bank of America — have been lobbying for the change in Dodd Frank, which had given them a period of years to comply. Trade associations representing banks, the Financial Services Roundtable and the American Bankers Association, emphasized that regional banks are supportive of the change as well. But the regulatory change could also boost the profits of major banks, which is why they are pushing so hard for passage, said Simon Johnson, former chief economist of the International Monetary Fund and a professor at the MIT Sloan School of Management. “It is because there is a lot of money at stake,” Johnson said. “They want to be able to take big risks where they get the upside and the taxpayer gets the potential downside,” he said. When I learned that the Intelligence Authorization Act for FY 2015 was being rushed to the floor for a vote—with little debate and only a voice vote expected (i.e., simply declared “passed” with almost nobody in the room)—I asked my legislative staff to quickly review the bill for unusual language. What they discovered is one of the most egregious sections of law I’ve encountered during my time as a representative: It grants the executive branch virtually unlimited access to the communications of every American. On Wednesday afternoon, I went to the House floor to demand a roll call vote on the bill so that everyone’s vote would have to be recorded. I also sent the letter below to every representative. With more time to spread the word, we would have stopped this bill, which passed 325-100. Thanks to the 99 other representatives—44 Republicans and 55 Democrats—who voted to protect our rights and uphold the Constitution. And thanks to my incredibly talented staff. They would allow financial institutions to trade certain financial derivatives from subsidiaries that are insured by the Federal Deposit Insurance Corp. — potentially putting taxpayers on the hook for losses caused by the risky contracts. Big Wall Street banks had typically traded derivatives from these FDIC-backed units, but the 2010 Dodd-Frank financial reform law required them to move many of the transactions to other subsidiaries that are not insured by taxpayers. 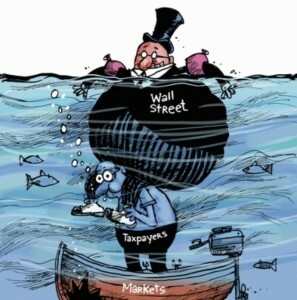 Wall Street has for some time attempted to put taxpayers on the hook for its derivatives trades. WASHINGTON — Wall Street lobbyists are trying to secure taxpayer backing for many derivatives trades as part of budget talks to avert a government shutdown. The bank perks are not a traditional budget item. They would allow financial institutions to trade certain financial derivatives from subsidiaries that are insured by the Federal Deposit Insurance Corp. — potentially putting taxpayers on the hook for losses caused by the risky contracts. Big Wall Street banks had typically traded derivatives from these FDIC-backed units, but the 2010 Dodd-Frank financial reform law required them to move many of the transactions to other subsidiaries that are not insured by taxpayers. Last year, Rep. Jim Himes (D-Conn.) introduced the same provision under debate in the current budget talks. The legislative text was written by a Citigroup lobbyist, according to The New York Times. The bill passed the House by a vote of 292 to 122 in October 2013, 122 Democrats opposed, and 70 in favor. All but three House Republicans supported the bill. It wasn’t clear whether the derivatives perk will survive negotiations in the House, or if the Senate will include it in its version of the bill. With Democrats voting nearly 2-to-1 against the bill in the House, Senate Majority Leader Harry Reid (D-Nev.) never brought the bill up for a vote in the Senate. Remember what Wall Street wants, Wall Street gets.